Several archetypal situations repeat themselves in Hitchcock's movies: one of them is a fascination with voyeurism - of watching people who do not know they are being watched. Another is the notion of an innocent man wrongly accused. If Hitchcock made a career out of indulging our voyeuristic tendencies and our uncertainty regarding the guilt of others, he never excited them more skilfully, or with more gleeful self-awareness, than in Rear Window. For the reader, Literature allows scope for the imagination, but for the viewer cinema defines its action through the concrete visual image. Novels can elucidate every thought and feeling of a character at every moment, but film cannot. Having only the visual image to refer to, much must be surmised - there is always is some 'guesswork ' involved. Cinema, first and foremost, is a visual medium. It is a form of voyeurism, where we can guiltlessly sit and watch the private lives of other human beings, even in their most intimate moments, with impunity. In Rear Window, laid up with a broken leg during a hot city summer, photojournalist L.B. Jeffries (James Stewart) is confined to his tiny, sweltering courtyard apartment. To pass the time between visits from his nurse (Thelma Ritter) and his fashion model girlfriend Lisa (Grace Kelly) Jeffries indulges his journalistic 'research' tendencies by staring through binoculars and more tellingly, his camera lens, out of the rear window of his apartment at the goings-on through the windows of the other apartments around his courtyard. As he watches the lives of neighbours unfold, he fancifully assigns them roles and characters, such as "Miss Torso" - a pretty professional dancer with a healthy social life or "Miss Lonelyhearts" - a middle -aged woman who fantasises about entertaining nonexistent gentlemen callers. Of particular interest is the seemingly mild-mannered travelling salesman Lars Thorwald (Raymond Burr), who is living with a disgruntled, invalided wife. One afternoon, Thorwald pulls down his window shade, and his wife's incessant taunts come to a sudden halt. Out of boredom, Jeffries casually concocts a scenario in which Thorwald has murdered his wife and disposed of the body in a gruesome fashion. The problem is, Jeffries' idle musings appear to become increasingly likely to be fact. 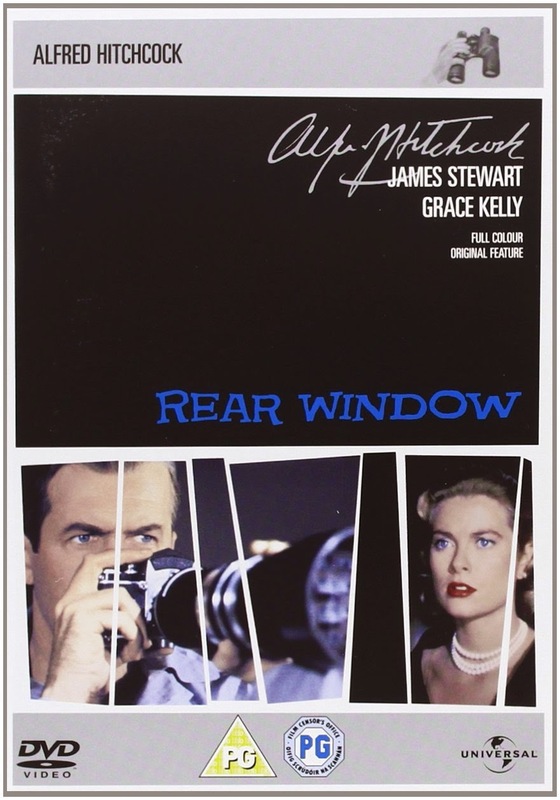 Rear Window is a film about a man who does on the screen what we do in the audience - look through a lens at the private lives of strangers. Jeff, the protagonist, is trapped in a wheelchair, and we're trapped with him. His frustration at his inability to live out his own life forces him to live through the lives of others. We too are trapped inside his point of view, inside his lack of freedom and within his limited options. When he passes his long days and nights by shamelessly maintaining a secret watch on his neighbours, we must share his obsession. It's wrong, we know, to spy on others, but we are inevitably voyeurs when we go to the movies. Jeffries sits in his wheelchair, holding a camera with a telephoto lens, and looks first here, then pans over there, just like a movie camera would. What he sees, we see. What conclusions he draws, we draw, all without words, because in essence both Jeff, and we the viewers, are watching a series of silent movies (there is no soundtrack except the ordinary sounds of the city in these shots). But this is a Hitchcock film, so these 'silent' images begin to create a montage of unease and suspicion. Across from Jeff’s window he observes events that encapsulate stories that he begins to relate to. What is extraordinary for a film that works on this level, is that it also manages to be a riveting thriller. The murder scene (which perhaps one can only appreciate best on a second viewing) is a masterpiece of suggestion and ellipsis. In contrast to the more overt killings in Hitchcock's Psycho, six years later, this murder happens out of sight, behind lowered blinds. The scream almost goes unnoticed in the New York night and in the aftermath not a drop of blood is seen. The rain falls, Thorwald shuttles in and out of his apartment carrying his silver-coloured salesman's suitcase and we are only left to imagine what exactly, it contains. The film is essentially an idea only to be played out in an urban environment and there is something purposefully claustrophobic and ascetic in the way Hitchcock allows us no soundtrack other than the music that his protagonist actually hears and allows us to see only what he sees - all at a distance, always at one removed. What Rear Window has to say about people and human nature is fairly superficial, but it does expose many facets of the loneliness of city life and it tacitly demonstrates the impulse of morbid curiosity. Here we have the frisson of the forbidden, the promise of the sensational, but alongside it is always the risk of the unexpected and unwanted menace, of secrets we would rather not know.